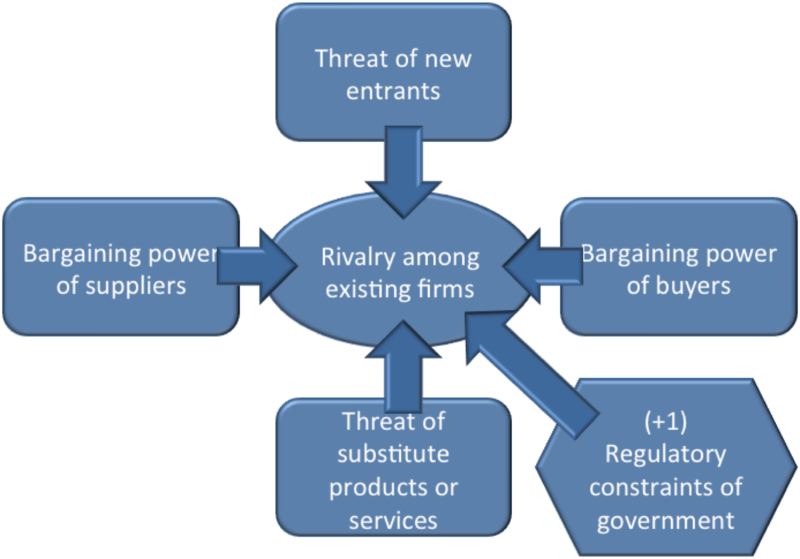 Porter’s model shows schematically the competitive business environment by simulating a competitive situation. The main objective of a business is to obtain a sustainable competitive advantage in its sector and thus to generate profit by resisting pressure forces or threats exerted on it. The original model neglects a form of pressure on companies: The legal constraints imposed by government. That is why this model has evolved: We speak now of the 5 (+1) Porter forces. (+1) Regulatory constraints of government. To measure the attractiveness of an industry. Analysis of Porter’s 5 (+1) forces identifies therefore strategic elements that need to master in order to gain competitive advantage. For this, it is necessary to prioritize the 5 (+1) forces to identify strategic actions to be undertaken in order to escape their influence and thus see the profitability of decreased activity.